Pilot Phoenix recently participated in and sponsored a golf tournament hosted by SALEO, the Southern Arizona Logistics Education Organization. This group’s mission is to educate, promote and grow the transportation and logistics industry by networking the logistics service providers and users in the Arizona-Mexico region. In the past four years, PHX has benefited greatly from its membership in SALEO. 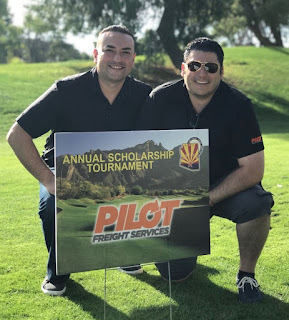 “Through this affiliation, we’ve been able to grow our local customer base, so we were more than happy to give back via this event,” says Mauro Rodriguez, sales manager, Pilot Phoenix. Pictured at left is Mauro and Jose Rebeil, account executive, Pilot Phoenix.